SCVHistory.com LW3337 | William S. Hart | Winifred Westover Hart: Vital Statistics, 1898-1978. Mrs. William S. Hart's maiden name wasn't originally Winifred Westover, she wasn't born in 1899, and she wasn't born in San Francisco ... which almost all sources say she was. We've got a lot of correcting to do on SCVHistory.com. It's not our fault, really. Winifred consistently misreported her age and other vital data, making herself younger or older depending on necessity. At least she was consistent. 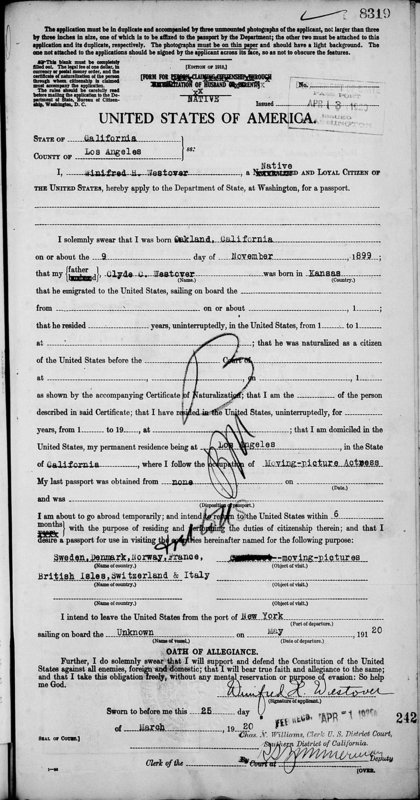 Per her birth certificate, William S. Hart's one and only wife was born Winifred Helena von Heide in Oakland on November 9, 1898 — nine months after her birth parents wed. A pattern emerges. 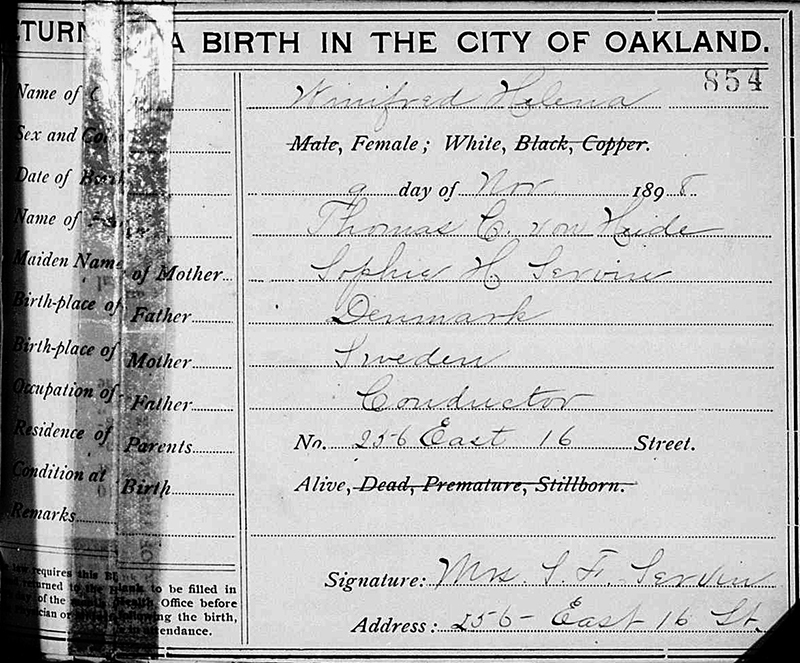 When Winifred was born, the family was living at 256 E. 16th Street in Oakland. (The address no longer exists.) 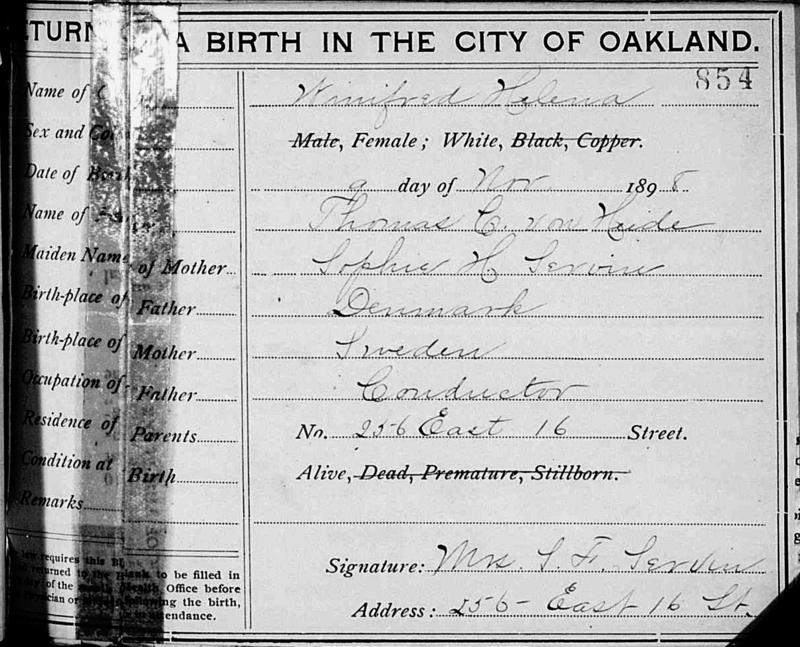 By June 1900, when the U.S. Census for Oakland was enumerated, they had moved to 1479 21st Avenue in Oakland. 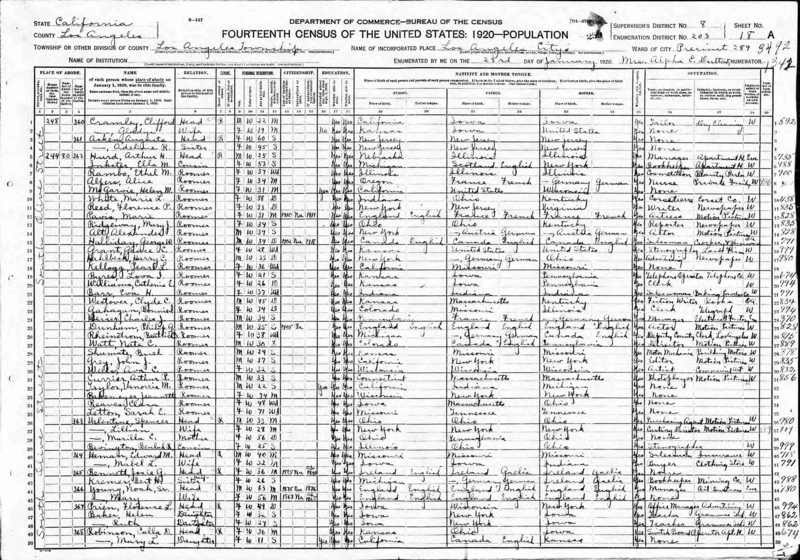 The 1900 Census correctly shows Winifred's month and year of birth (November 1898). Sophie and Thomas called it quits in 1904 when Sophie sued him for divorce on grounds of desertion. When Sophie started living with Clyde Carl Westover, we don't know. In 1900, Clyde Westover wasn't yet part of Winifred's story. The U.S. Census shows Clyde, a customs house clerk from Kansas, born in March 1874, living with his then-wife Blanche M., an immigrant from Australia born in 1876. They're actually listed twice in the 1900 U.S. Census: living in San Francisco with Clyde's father, John, a "capitalist" from Massachusetts; and on their own in Marin County. By 1913, Clyde and Blanche had divorced. So had Winifred's parents, Thomas and Sophie. It seems Clyde and Sophie wanted to keep their relationship a secret, because they traveled to Los Angeles to get married — under their middle names, Carl and Hildur — on October 6, 1913. A notice in the San Francisco Call said Clyde/Carl had "failed to inform his friends that he was to end his bachelor days." They had been living together in Oakland. Winifred's mother, Sophie, accompanied her to Sweden. It must have been a good trip, because it shaved three years off of Sophie's age. For whatever reason, the passenger list for the return voyage (by way of Copenhagen) wrongly says Sophie was born in Illinois. Where was Clyde Westover in 1920? Divorced and living in a flop house in Los Angeles where he was trying to make it as a novelist. Dial up the clock one year, and things get absurd. William S. Hart, Winifred's costar from 1919's "John Petticoats," rekindled their relationship in the fall of 1921 (Davis:ibid.). In late November, Bill proposed. On December 5, Winifred and her mother arrived in Los Angeles by train from New York. On December 6, Bill celebrated his 57th birthday. On December 7, Bill and Winifred were wed at Bill's Hollywood home, 8431 De Longpre Avenue (which still exists and is used by the Actors Studio). Winifred was 23. But not according to the official documents. Bill and Winifred shortened their 35-year age gap to just 23 years by trimming 9 years off of Bill's age (making him 48) and adding 2 to Winifred's (making her 25). Clyde is listed as Winifred's father. Sophie apparently liked the idea of being born in Illinois. Professionally, during and after his movie career, Bill always lied about his age. He usually said 1868, 1871 or 1874; he was actually in his 50s when he was landing roles intended for a man of 30. Bill's name on the marriage license is William Surrey Hart. Nine months later, when their son was born, Winifred attempted to name the boy for his father but failed. She reported his name on the birth certificate as William "Surry" Hart, Jr.
Bill and Winifred had formally separated the previous May. The famed two-gun man actually lost a year between his December 1921 wedding and his son's birth in September 1922 when Winifred reported his age as 47. As for herself, Winifred kept up the fiction of being 22. Remember Thomas von Heide, Winifred's natural father, who abandoned his family in 1904? Well, he resurfaced out of nowhere two decades later to make public accusations against William S. Hart and his sister, Mary Ellen, when Bill and Winifred's marriage ended. Winfred was not amused. She told the press: "I adopted the name of my mother's second husband shortly after she was married to Clyde Westover. I went through the Oakland High School under the name of Winifred Westover. "Mr. Westover did everything in the world for me. My real father has done nothing. He deserted my mother when I was 5 years old and never paid her the $15 a month alimony allowed for my rearing." Thomas died in Los Angeles six months later. Special thanks to Tricia Lemon Putnam for providing the clue that led from one thing to another. Winifred's 1898 birth home apparently no longer exists, but this would be the row of houses on 21st Avenue in Oakland where she lived in 1900 with her parents, Thomas and Sophie von Heide. If the street numbers have changed over the last century, it could be one of the houses in the middle, but it's probably the one on the right, which has been remodeled and renumbered and now faces 15th Street. Click to enlarge. 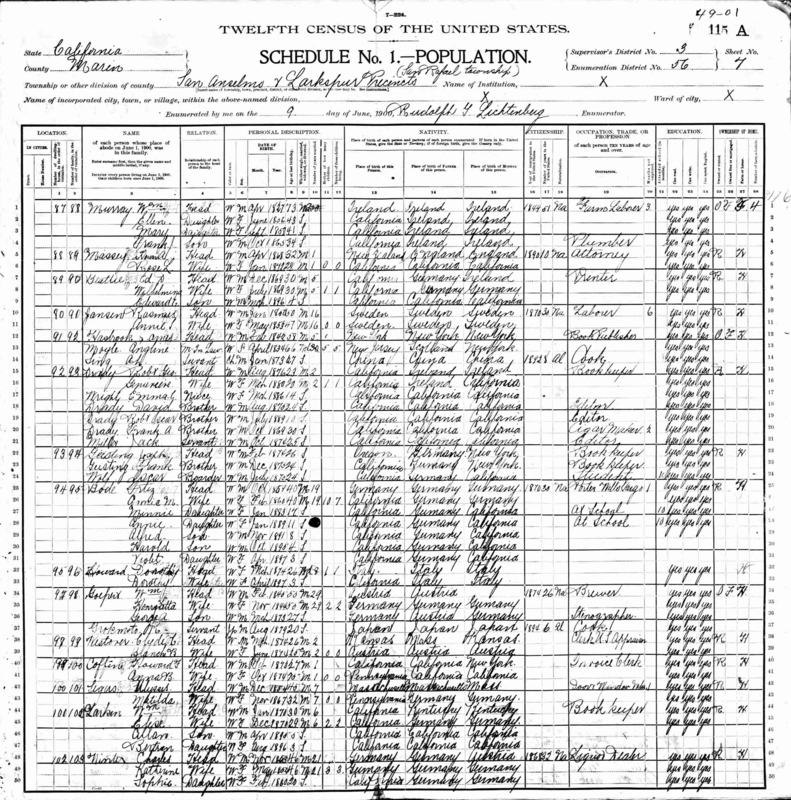 1900 U.S. Census: Von Heide family. Click to enlarge. 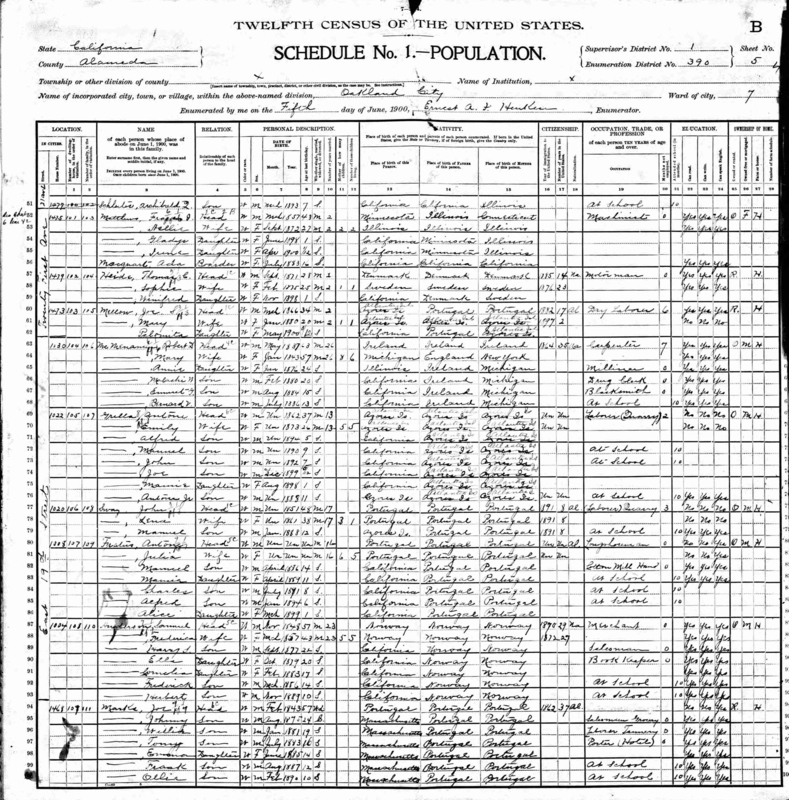 1900 U.S. Census: Clyde and Blanche Westover (1 of 2). Click to enlarge. 1900 U.S. Census: Clyde and Blanche Westover (2 of 2). Click to enlarge. 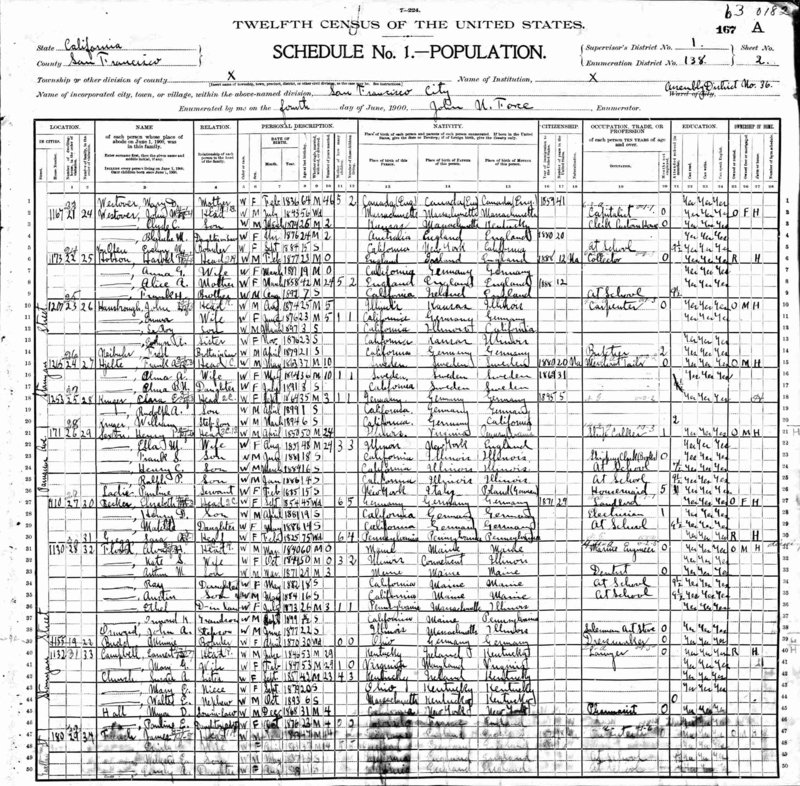 1920 U.S. Census: Clyde Westover. Click to enlarge. Notice: Separation of Thomas and Sophie von Heide, 1904. Click to enlarge. 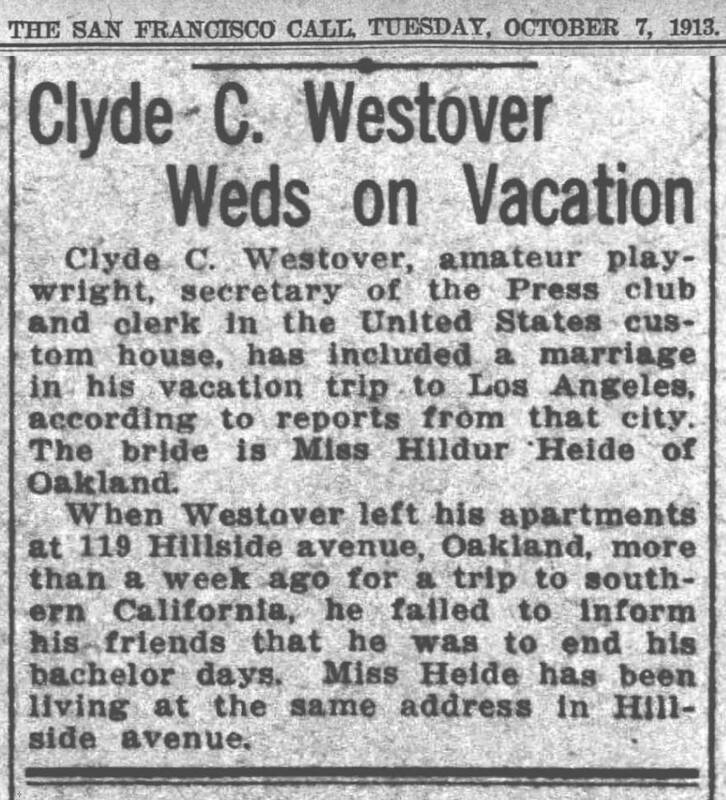 Notice: Clyde Westover's surprise marriage, 1913. Click to enlarge. Winifred's passport application, 1920. Click to enlarge. 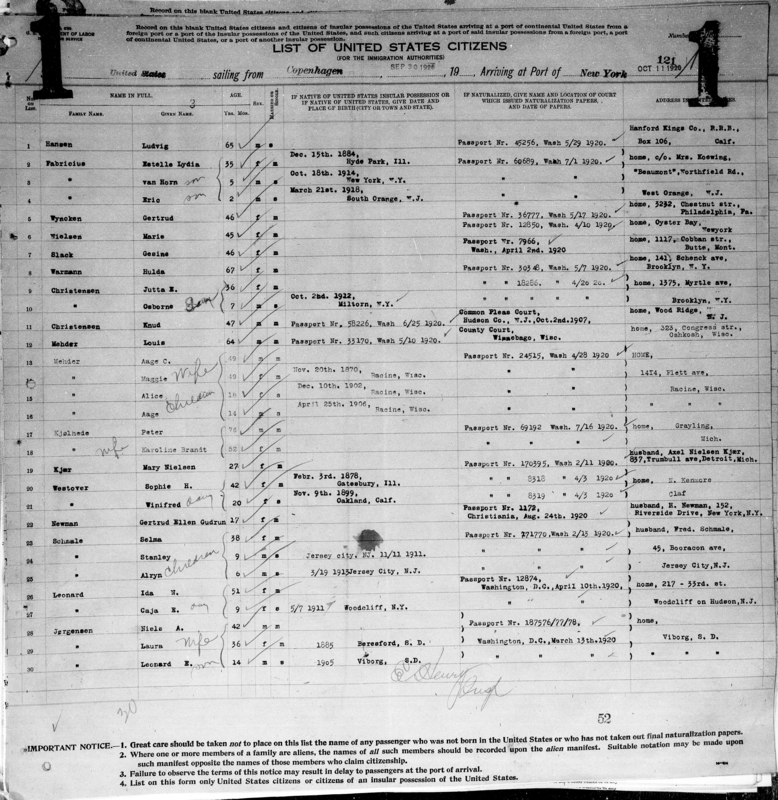 Passenger list, 1920: Sophie and Winifred Westover. Click to enlarge. 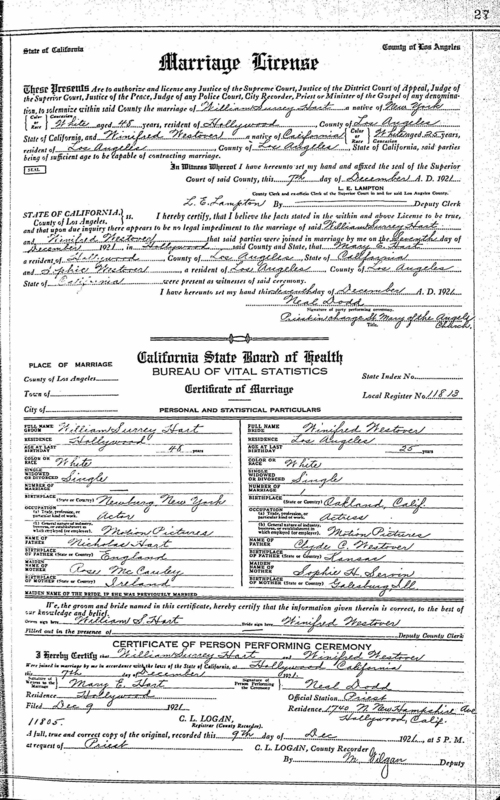 Marriage license, Clyde (Carl) Westover and Sophie (Hildur) von Heide, 1913. Click to enlarge. Marriage license, William S. Hart and Winifred Westover, 1921. Click to enlarge.